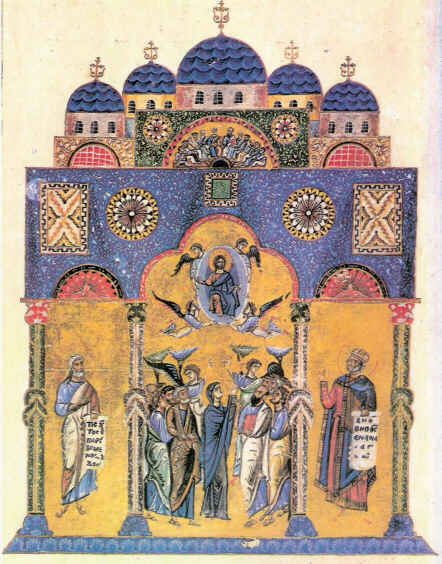 An image from a Vatican Codex Vat.gr.1162 (11th century) believed to be a representation of the Church of the Holy Apostles. The original Church of the Holy Apostles was dedicated in about 330 by Constantine the Great, the founder of Constantinople, the new capital of the Roman Empire. The church was unfinished when Constantine died in 337, and it was brought to completion by his son and successor Constantius II, who buried his father's remains there. The church was dedicated to the Twelve Apostles of Jesus, and it was the Emperor's intention to gather relics of all the Apostles in the church. For this undertaking, only relics of Saint Andrew, Saint Luke and Saint Timothy were acquired, in 336, and in later centuries it came to be assumed that the church was dedicated to these three only, although it did contain many other relics. Paulinus of Nola informs us: "When Constantine was founding the city named after himself and was the first of the Roman kings to bear the Christian name, the God-sent idea came to him that since he was embarking on the splendid enterprise of building a city that would rival Rome, he should also emulate Romulus’ city with a further endowment, by gladly defending his walls with the bodies of the apostles. He then removed Andrew from the Achaeans and Timothy from Asia. And so Constantinople now stands with twin towers, vying with the eminence of great Rome, or rather resembling the defenses of Rome in that God has counterbalanced Peter and Paul with a protection as great, since Constantinople has gained the disciples of Paul and the brother of Peter." Emperor Constantius (337-361), the son of Constantine the Great, transferred the relic of the Apostle Luke from Thebes to Constantinople, by means of Saint Artemios the great duke of Egypt and Martyr. It was treasured in the Church of the Holy Apostles beneath the Holy Altar, together with the honorable relics of Andrew and Timothy the Apostles. The renovated and enlarged Church of the Holy Apostles was consecrated on 28 June 550 under Emperor Justinian. The church was renovated and probably enlarged again in the ninth century by the Emperor Basil I. Many of the emperors and royals of Constantinople were buried there. On June 20th we commemorate the Placement of the Relics and Garments of the Apostles Luke, Andrew and Thomas, the Prophet Elisha, and Martyr Lazarus, in the Church of the Holy Apostles in Constantinople. Towards the end of the reign of Emperor Constantine VII Porphyrogennetos (913-959), the relics of the Prophet Elisha were transferred to Constantinople and placed in the Church of the Holy Apostles. The emperor also learned that there were various relics, particularly garments, of the Apostles Luke, Andrew and Timothy scattered throughout Constantinople, so he had them gathered up and placed in the Church of the Holy Apostles as well. Among the relics gathered were also that of the Holy Martyr Lazarus, who was martyred with his companions in Persia in the fourth century and is celebrated on March 29th.